On May 10 the Calcasieu Parish Sheriff’s Office responded to a call from a local church in reference to forgery and theft. The investigation revealed an employee, Lenny M. McLendon, 40, Westlake, had written over 200 church business checks to herself from 2012 through March 2016, totaling over $166,700. Documentation was obtained that showed she had forged signatures of board members’ names to the checks, along with other paperwork. McLendon was arrested on May 23 and booked into the Calcasieu Correctional Center. She was charged with theft over $25,000; and forgery. 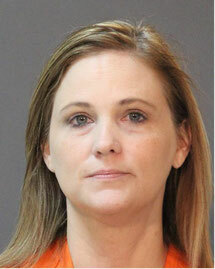 Judge David Ritchie set her bond at $40,000. CPSO Detective Troy Thibodeaux is the lead investigator on this case. The investigation is ongoing. What i do not realize is in truth how you are now not actually a lot more neatly-liked than you might be right now. You're so intelligent. You recognize thus considerably in relation to this subject, made me for my part imagine it from so many various angles. Its like women and men aren't interested unless it's something to accomplish with Woman gaga! Your personal stuffs great. All the time take care of it up! Hi there! This post couldn't be written any better! Going through this post reminds me of my previous roommate! He continually kept preaching about this. I will send this post to him. Fairly certain he will have a very good read. Many thanks for sharing! Oh my goodness! Incredible article dude! Thank you, However I am experiencing issues with your RSS. I don't know why I cannot join it. Is there anyone else getting similar RSS issues? Anyone that knows the solution will you kindly respond? Thanks!! What's up, I wish for to subscribe for this blog to get most up-to-date updates, thus where can i do it please assist. I got this site from my friend who told me concerning this website and at the moment this time I am browsing this site and reading very informative posts here. I visited several websites however the audio quality for audio songs current at this site is genuinely fabulous. My programmer is trying to persuade me to move to .net from PHP. I have always disliked the idea because of the costs. But he's tryiong none the less. I've been using Movable-type on a variety of websites for about a year and am nervous about switching to another platform. I have heard very good things about blogengine.net. Is there a way I can import all my wordpress content into it? Any kind of help would be really appreciated!